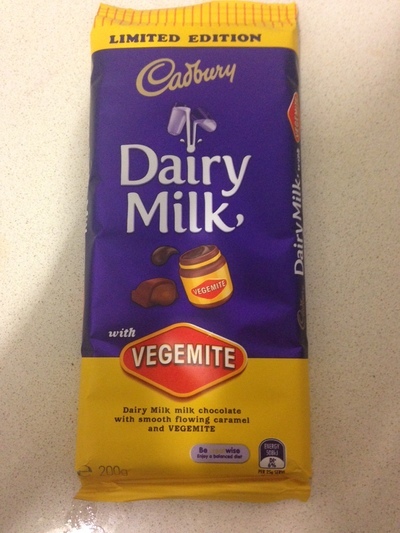 Long anticipated after rumour of it's launch was 'accidentally' leaked online via Facebook, Cadbury has officially launched the much talked about limited edition of it's Dairy Milk bar with the great Australian staple, Vegemite. Cadbury Dairy Milk and Vegemite, available for a limited time. Sold as a 200g bar, I spotted this at my local Coles supermarket for around $4 and they seemed to be flying off the shelves as Aussies are keen to give it a try. To be fair I am NOT a Vegemite fan, can't stand the smell or taste of it, but I also wasn't raised on it either. My partner loves it. So this was a purchase made not for me but for them. I did give it a try and must admit that while I can't stomach Vegemite on it's own this one is actually a bit better. The squares are filled with a gooey caramel much like their caramel blocks. So it makes this chocolate taste more like a VERY burnt salted caramel. It's salty and tart and the Vegemite flavour doesn't quite hit you at first, but it does leave a strong Vegemite after taste. So while at first it didn't appear to be too bad, it was that strong yeasty bite of traditional Vegemite flavour that hits you afterward that just didn't sell me. Would I try it again, definitely not. Would my partner? Absolutely. It truly is a 'love it or hate it' product that Vegemite fans are certain to not get enough of and people like me are happy to pass up. My rating a 2 out of 5. My partners, a 5 out of 5. You'll find this limited edition chocolate available now at Coles until June where it seems it'll be launched in all major supermarkets for a limited (although unspecified) amount of time. Would I? NO, never, well not unless they made it with DARK chocolate! That is so weird and wrong I just can not even... However, now that they've created it it seems a bit surprising that they didn't do it sooner.